Local artists and local businesses have come together at the Coffs Harbour Regional Gallery in an innovative showcase of 50 new artworks sponsored entirely by the Coffs Coast business community. President of the Friends of the Gallery Heather McKinnon being interviewed by Dennis Driver of NBN Television. ‘New Year: New Work’, which is opening on Saturday, February 2, features 50 brand new works which were each sponsored by 50 local businesses – an idea brought to fruition through the hard work and support of the Friends of the Gallery. With over 50 businesses taking part, the new exhibition will raise significant funds for the Friends of the Gallery so they can continue to support the acquisition of new works or assist with exhibitions and events such as ‘STILL: National Still Life Award’, coming up later in 2019. The featured artists are Leonard Aitken, Jan Allsop, Nanette Backhouse, Matthew Begg, Stefan Bruggisser, Sara Bowen, Cher Breeze, Danielle Burford, Terri Butterworth, Amber Carbury, Jo Elliott, Ben Fayle, Sheryl Fisher, Rob Garrett, Guy Gilmour, Averil Harris, Ted Hillyer, Adrienne Hmelnitsky, Nicholas Kachel, Jeanette Keough, Michael Langley, Violetta Lanza, Penelope Lawry, Georgie Luckock, Brentyn Lugnan, Josh Mackenzie, Lynne Mak, Gloria Malone, Raymond Mather, John Mawhinney, Tonya McIver, Bim Morton, Laurie Mossuto, Sarah Mufford, Julie Nash, Jenny Parkin, Sandra Pitkin, Will Price, Yvonne Quadros, Isabel Rickets, Ray Rixon, Bronwyn Rodden, Jeramie Scahill, Tyrone Sheather, Jeremy Sheehan, Alanna Shorter, Jane Sturrock Nash, John Thiering, John Van Der Kolk, Peter Wade, Nick Warfield, Alison Williams, JP Willis, and Christine Wilson. At the same time, a separate experimental installation, ‘Work in Process’ will also be on show. In this, a painter, a photographer and an arts therapist – co.lab.arts – have come together to work collaboratively on a project. 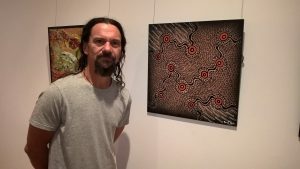 The resulting exhibition includes photographs, working journals, paintings and sculptures created by the three Bellingen artists Ruth Ackary, Jay Black and Karlee Rawkins. New Year New Work will be on show until 2 March 2019. (Pictured above is President of the Friends of the Gallery Heather McKinnon being interviewed by Dennis Driver of NBN Television). Artist Brentyn Lugnan and his New Year New Work artwork which is featured in the show. The above is a Press release from the Coffs Harbour City Council – Thursday 31 January 2019.